jingle H. kringle why am I so happy?!?! ...But also... A Ras Al Ghul playset before we get a Supergirl or a Batcave with an Alfred? The board's software translates "J E S U S" and "C H R I S T" into "Jingle" / "Kringle". How many hero vs. villain two-packs have been released lately (Feb-Mar 2018)? ...Are there any more figure two-packs like these out there? Last edited by miguelvaldezlopez on Fri Mar 16, 2018 5:51 pm, edited 1 time in total. Doesn't one of the Mummy Universe figure packs have some sort of sarcophagus where the Explorer turns into a mummy? They could do that with a Clark Kent figure (it would put a superman Cape on it). Sort of what's already on the Fortress of Solitude playset. Just found this on a random google search. Repaint and all I'd like to get it. I was thinking more along the lines of a shut the door and the back flips around to change figures or something along the lines of the old Mego Enterprise or Hall of Justice playsets and their teleporter gimmicks. That is nice... I'd like to see the Hot Wheels team apply those colors to the 66 Batmobile. This is the only line that uses such blatant re-use of molds in such a way that keeps us clamoring for more. I can’t even begin to understand why I want basic reprints so much with this line. My wishlist of characters to come would be Supergirl, deadshot, lobo, Dr Fate, kid flash, aqualad, Low, Arkillo, Atrocitus, and Duke Thomas. I can't believe they made so many different guys already. When this line first came out I never thought they would make a red hood, now we got him and Thomas Wayne. 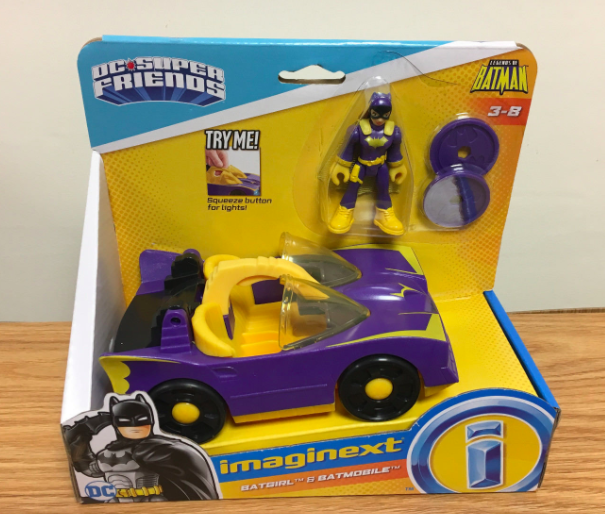 Imaginext is the best! Hope they slow down a little bit here now tho. So many coming out in this new wave at once. I'm gonna go broke. I picked up the blind bag Series 4 Batman, Joker & Robin today. And the other day at my local Shop-Rite I picked up the Nightwing & Black Canary motorcycle set and finally the Batman Beyond Motorcycle at WalMart. I'm loving this new product. That Red batmobile I'll use for Thomas Wayne Batman or Red Hood (if I get him at some point).